Adaptronic Engine Management Systems – Lucky 7 Racing Inc. There are many different engine management systems on the market today –especially in Australia, by spinoff brands of larger companies. In a fashion similar to what you often see in the forced induction industry, many parts on the market tend to simply be re-branded versions of parts that originated at other companies, but with slight tweaks. So how does one decipher which unit to use on their own car? The industry doesn’t make it easy. Not many companies actually break down what the units can and can’t do. More importantly, they don’t tell you how they do it or what kind of support (if any) they offer. It’s not as simple as saying brand X will drive 8 fuel injectors and do closed loop tuning. For example, brand X may allow up to 8 injectors, but they won’t work properly with Bosch Motorsports injectors, or their closed loop tuning only really works in theory, not in practice. In this article we will explain and decipher the Adaptronic brand of EMS. Adaptronic offers plug-and-play units for Series 4, 5, 6, 7 & 8 Rx-7s, and Series 1 RX-8s. No other company offers more plug-and-play solutions for Mazda Rotaries. Furthermore, all of the 3 wire-in models can be used on any rotary engine, including Series 2 RX-8s, 3, and 4 rotor applications. The technical features that set Adaptronic apart in the rotary world are the combination of the following: Oil Metering Pump Control, Stock Twin Turbo Control, Wide-band serial input, VE tuning with staged injection, Automated Injector & Valve Staging, and Adaptive Self Tuning. Furthermore, these units, like the other models, get the latest implementations based on demand, such as: Automatic Injector Dynamics injector dead lag settings, PLX Multi-Gauge display integration, Advanced Engine Protection Features, etc. Adaptronic continues to push the envelope by working in conjunction with other big names in the rotary game, such as Abel Ibarra from Flaco Racing. Recently, Ibarra collaborated with Adaptronic and provided information on a rotary specific fuel strategy that he says took him 3 years of dyno time to figure out. This is part of the reason why his 3 rotor RX-8 was able to make over 1800HP on sideports at a mere 38psi. This firmware update should be out soon. Adaptronic is also involved with another big project, the R12 12 rotor engine. Tyson Garvin is currently installing an Adaptronic E1280S with a special multiplexer for this 960ci 12 rotor motor. 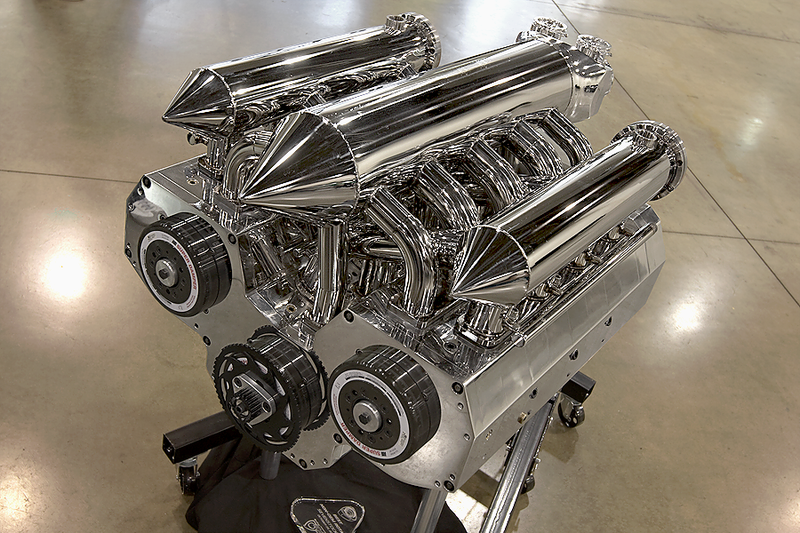 Garvin’s goal for this completely billet engine is between 5 and 7000hp with forced induction! Adaptronic has also proved its reliability with the RicShaw Racing crew’s endurance RX-7. Their 2 rotor turbocharged 13B power plant has lived for several 12+ hour races, including the Bathurst 12 hour. 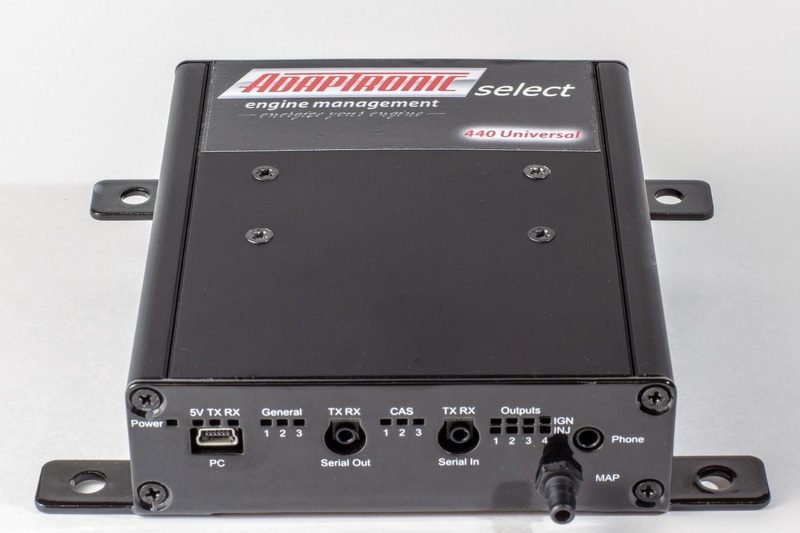 Adaptronic is also starting to make a big name in the Diesel industry with its patented E1280 super computer. There aren’t many ECUs that can control direct injection fuel injectors. The Adaptronic E1280S is a patented FPGA unit (field-programmable gate array), a completely configurable tuning system that allows the tuner to implement any control function that can be articulated, using a system of basic elements like maps/tables, PID controllers, timers and basic arithmetic and logical functions. RV engineering in Holland has developed a separate and necessary DF injector driver for the diesel applications. 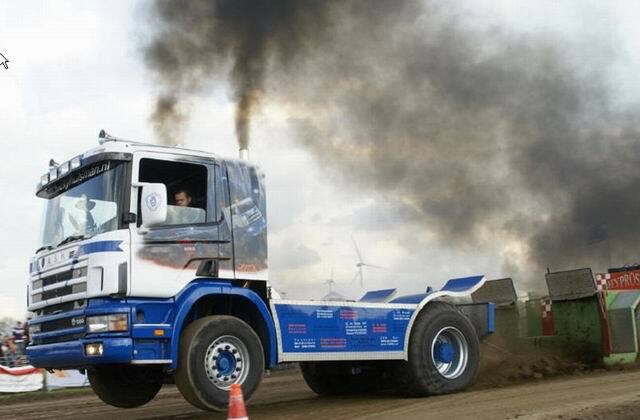 Rudd at RV engineering is dominating the extreme diesel competitions with tractor pullers up to 3000hp! So which unit is right for you? Adaptronic is known for its plug-and-play units, but it also has 3 levels of wire-in models. The plug-and-play units (PNP) are just as they sound, a direct replacement for the factory ECU that can be usually be installed in less than 20 minutes. These units come completely configured for your vehicle’s factory sensors, and come with a base map for a stock-ish car. You can then choose to run the factory map sensor or switch to the internal 4 bar. If your car came equipped with a mass air flow sensor you will need to select the 4 bar internal map sensor. The wire-in models are a bit more complicated, and are generally used on cars with old, worn out wiring harnesses, or where PNP models aren’t available. The wire-in models can be used on virtually any engine, even those with variable valve timing (2JZ, Beams etc.) and/or dual drive-by-wire throttle bodies. All units can be configured to use any type of engine sensor, which makes them extremely versatile, including factory trigger systems. The entry level unit is the E420D basic, which has far more features than any other unit within its price range ($949 with a harness). It lacks Adaptive tuning, Flex fuel control, and Traction Control which are found on the E440D select. It does however have built-in boost control software, including boost by gear, advanced engine protection features, nitrous & water alcohol control, anti-lag, race dash integration, dual maps, automated injector staging, and VE tuning etc. The E440D select shares the same functionality as the PNP models. The E440D’s claim to fame is its Adaptive Tuning modes. This system is a lot more advance than your average auto tune feature. This unit will not only trim the fuel and ignition maps, but automatically edit the base values and perform “self tuning”. The E1280S super computer is the latest model on the list, and is a very sophisticated unit designed for professional motorsports. Its FPG-A based system allows you to manipulate the internal ECU code however you want, unlike standard models that require firmware updates. This setup is generally only seen on higher end ECUs, which are usually about twice the price of the 1280. Don’t be fooled though; this unit is far more complex than the other models, and it should only be used by very experienced tuners. If it’s not obvious now, due to all the external hyperlinks to Adaptronic’s YouTube Page and Blog, Adaptronic provides the absolute best technical and product support we have ever seen. This is an often undervalued/overlooked yet extremely important aspect for both end users and shops. There is nothing more frustrating than getting a product you simply cannot use, especially if you have a big race in a few weeks, or your customer is expecting their car next week. Furthermore, Adaptronic is more than willing to not only help with base maps, but also diagnose tuning issues via datalogs and engine files. Andy and Adaptronic are currently working on both a live online technical support system and a very intuitive software function, both of which will help guide users through any issues they may come across. We often hear from new dealers that they cannot believe how easy these units are to setup and tune. As always, Adaptronic is constantly trying to innovate their products, and will continue to impress those who choose their ECUs. The Adaptronic brand is starting to become a lot more popular, and its future looks extremely bright. Adaptronic was recently spotlighted in the Feb edition of Modified Magazine and the March edition of Import Tuner. Kenneth Moen, a driver from FormulaDrift, raced his Adaptronic Powered 2JZ during the Gatebil on Ice Event in Norway. EFI Parts in the UK is almost into the 9s with a few FWD cars making upwards of 900+ hp! We’ve also seen a few V8s down under making 1000+ rwhp. That same Adaptronic brand is steadily growing across the US with 38+ dealers. We at TurboSource are the North American Distributor, and we are always on the lookout for quality shops who want to invest with Adaptronic. 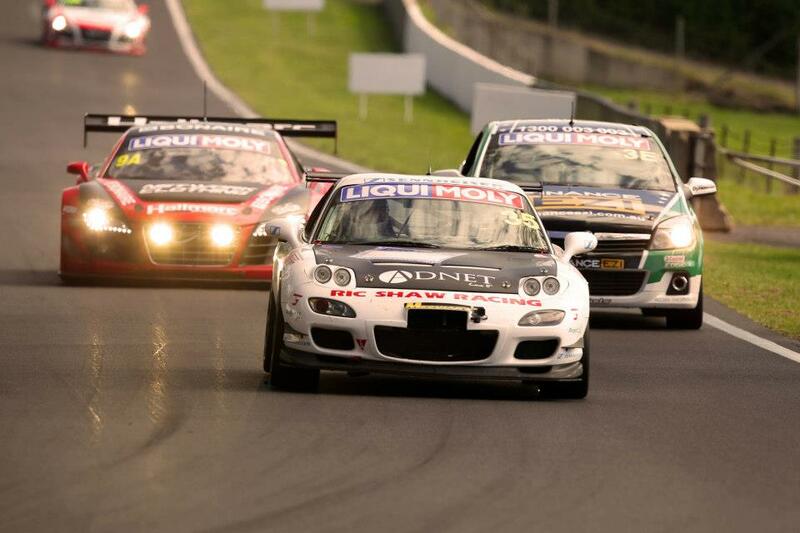 We also offer sponsorship opportunities for highly qualified vehicles.